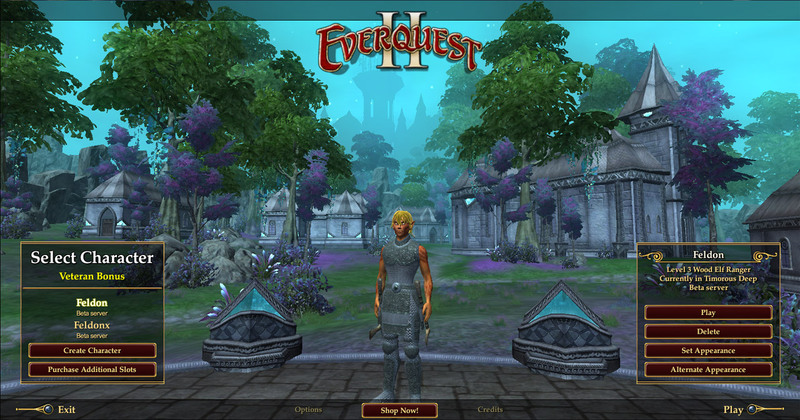 Showcased above is the new EQ2 Character Select screen set in Eidolon Plains. Screenshots of the two Chains of Eternity: Collector’s Edition mercenaries (your choice of Templar or Paladin for each of your characters), as well as the SOE Live mercenary (a Vampire Shadowknight) which became available early this week can be seen in our previous article EverQuest II: Chains of Eternity CE Items, AoD, and SOE Live. We’ve also posted a screenshot of the Collector’s Edition exclusive Wyvern Flying Mount in Ethernere colors. (1) The pre-order goes through 11:59pm PST on Monday, November 12th. (2) The mount is one per character. (3) Dashenti Lasheris (the mercenary that SOE Live attendees received for coming to the event) is an SK only. As explained by Iadas (thank you! ), you first need to “/claim” your SOE Live item, then examine the token, and then head to hire. (4) Players who buy the Collector’s Edition will have access to BOTH Lujien (werewolf) mercenaries – Krivix Honorclaw (Paladin) and Krivok Honorclaw (Templar). Do we get a choice between this new welcome screen and the old one? Sometimes I may want to change it back, just for memory’s sake. Does this mean CoE is going live on or shortly after the 13th? I could live with it not being random, as long as they updated it with each expansion/major GU (like they do the loading title logo). They didn’t do that the last time they changed it. If you were around since the beginning you may remember the original character select backdrop was from Isle of Refuge. I hope what Uberfuzzy said may be the plan, to change it with every expansion or major GU. All these purple trees and orange trees in the new zones are starting to remind me of those trees from the lorax though lol. I know the character select screen isn’t exactly a big part of the gaming experience, but I for one am really pleased this has finally been updated! The New Tunaria backdrop, as attractive as it is, had definitely become stale a long long time ago. I’d love to see it randomised also, which must of course be technically possible, but I think I have read something about this before from a dev who stated something along the lines of it would cause issues having to load additional assets prior to loading the game, which is fair enough. As Uber says, I really hope they can keep it updated and fresh every major Game Update featuring a new overland area, or at least every expansion – it’s all part and parcel of keeping things fresh. Bring back the old Background for character screen, my civil rights are violated!